Quick and Easy Pizza Recipe, Yes Please! The last thing anyone wants to do after a long day of working is to run to the grocery store, pick up ingredients, and come home to make dinner. This is where I have become the Queen of making something out of what you have already at home. One of my go to easy meals is homemade pizza. I would love to say I am ambitious enough after work to make my own pizza crust, but let’s be real. I use the pre-made crusts you can find at pretty much any grocery store. My favorite kind is from Whole Foods in their 365 Everyday Value Brand. It is easy to keep the crust in the freezer and just grab out one morning when you know you are going to want to have a quick and easy dinner. Now what goes on the pizza is where my creativity gets to come out. Instead of buying specific pizza toppings I like to use what I can find around the house. I have tried almost every type of vegetable, meat, and even various fruits, potatoes, and eggs. I have to say I have made some delicious concoctions. This last week I made two pizza’s, one savory and one sweet. For the savory pizza I used marina sauce, 1 red bell pepper, mushrooms, and beyond meatless chicken which is just a soy protein meat alternative. In order to make this pizza pop I added some garlic salt, a little cumin, a pinch of sea salt, and basil. Now you might notice there is one key ingredient missing from my pizza that most people find is a pretty integral part, cheese. I typically tend to pass on adding cheese to homemade pizza. Although I love cheese and I eat it quite often, I find pizza tastes just as good without it and saves a ton of calories. In order to save time I buy a lot of my vegetables pre-cut from trader joes, this makes throwing something together even faster and easier. For the sweet pizza I skipped the sauce and sprayed the pizza with some olive oil to start. 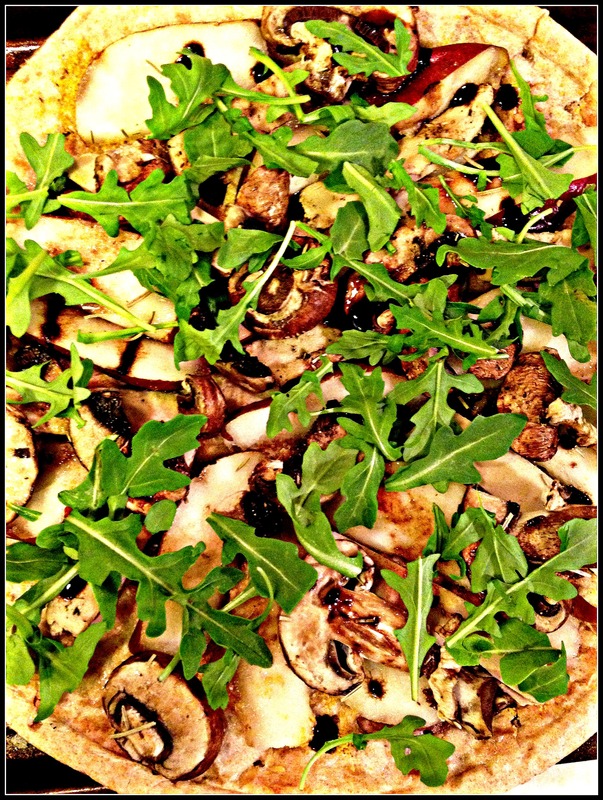 Next I sliced up a red pear, added sliced mushrooms, beyond meatless chicken, and arugula. I drizzled some balsalmic vinegar over the top, added a splash of salt, and some rosemary. For both Pizza’s I put in the oven for about 10 minutes and everything was cooked perfectly. If you are cooking thicker vegetables like squash, cauliflower, or broccoli I recommend cooking them a little first before adding them on the pizza. I will roast those types of veggies for about 10 minutes before putting onto the pizza and then cooking for an additional 10 minutes. Of the two pizza’s this sweeter one ended up being my favorite! 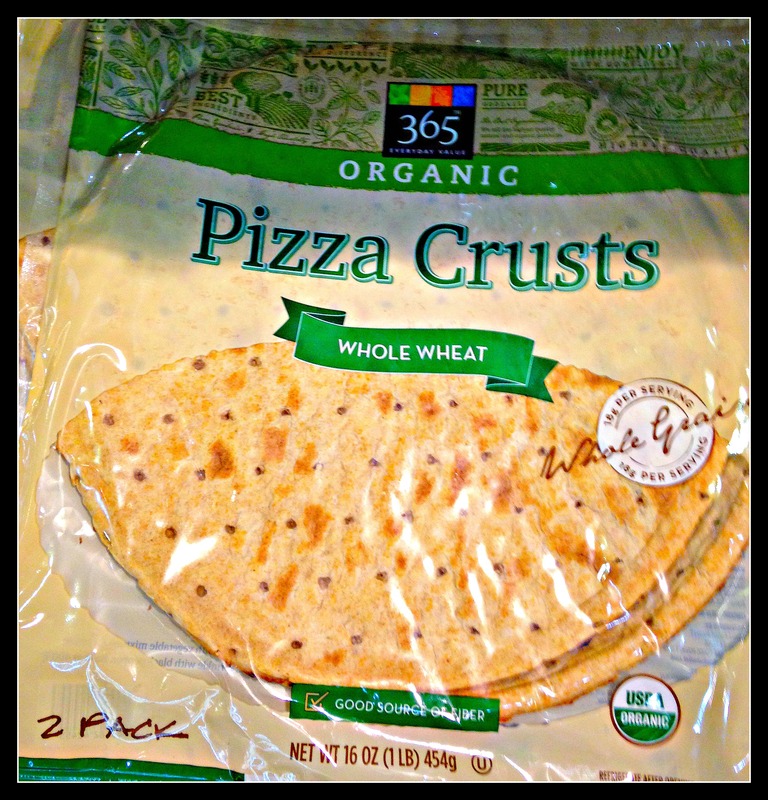 The Whole Foods pizza crust clocks in at 160 calories a serving with 8 servings in a total pizza. I typically will cut my slices into smaller slices so it feels like I am eating more. I find I am typically satisfied with about 3 small slices (about 2 actual servings according to the food label) as long as I am eating it with a giant salad. 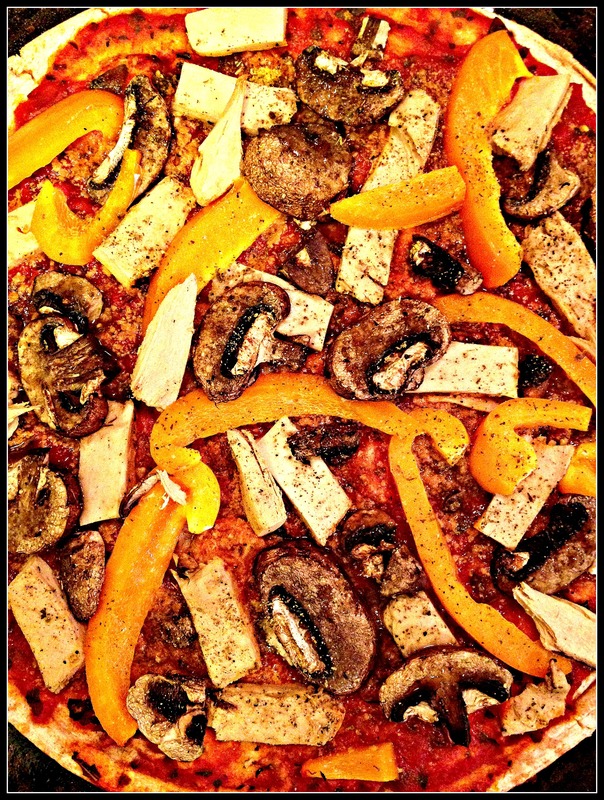 Partnering pizza with a bunch of veggies is a great way to balance the indulgence with something nutritious. Also by getting full on greens first you end up eating less pizza, but you still feel like you have not had to deprive yourself. If you mainly use vegetables and fruit for your pizza and avoid cheese you are looking at around 200 calories a slice, not too shabby! Great idea and very pretty to look at! !